White created Birmingham Totem in response to the bombing of the Sixteenth Street Baptist Church in Birmingham, Alabama, on September 15, 1963. The bombing, which killed four African American children, was a retaliation by the Cahaba Boys, a Ku Klux Klan splinter group, against efforts to register African American voters; the civil rights movement, which used the church as a meeting place; and the discussion of integration in Alabama. 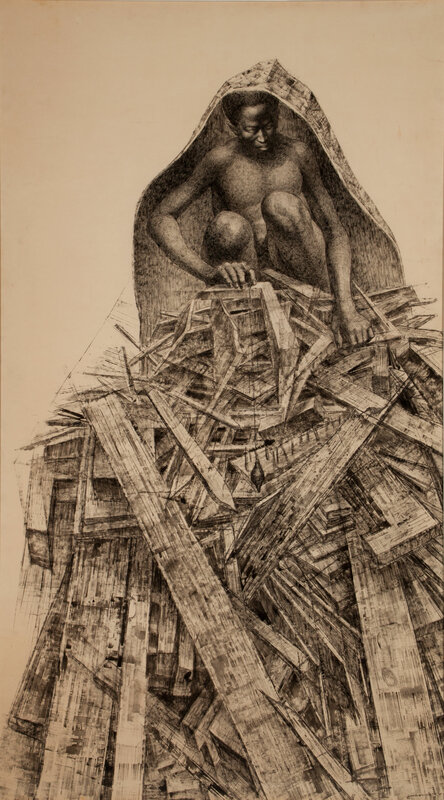 Birmingham Totem shows a young African American boy, shrouded in a large blanket, sorting through the debris of the bombing. White's three years in the Works Progress Administration's arts program introduced him to the Artists Union, a group whose efforts to improve conditions for artists taught him the power of artistic representation to advocate for justice and equal rights. "Birmingham Totem." Now Dig This! Art in Black Los Angeles, 1960–1980 Digital Archive. Los Angeles: Hammer Museum, 2016. https://hammer.ucla.edu/now-dig-this/art/birmingham-totem.